Young Country is a fresh and engaging exhibition that brings together nineteenth-century photography and contemporary poetry to offer a new and often surprising view of New Zealand’s past. The images are the work of William Williams, a Railways employee who worked and photographed widely through the country. His outstanding photographs reflect the rawness of New Zealand’s changing landscape as well as its beauty, and offer intriguing and unusual portraits of family and friends at work, home and play. Their rich detail, striking composition and absorbing content come as a revelation to many viewers. This is work that encourages contemplation, and rewards getting up close, looking and re-looking. 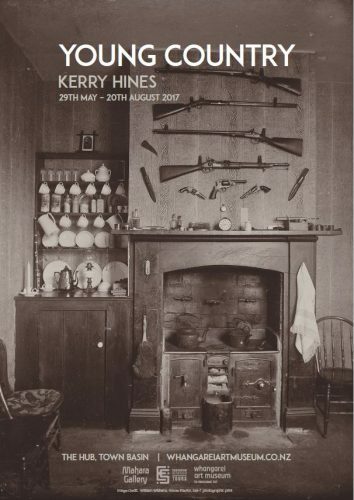 Kerry Hines has researched Williams’s work and context and written poems to accompany a selection of his photographs. Some are presented here as text accompanying photographs on the wall, while others can be heard while viewing images in the DVD work that forms part of the exhibition. The poems are colloquial, vivid and accessible, and include imagined elements as well as drawing on the subjects and contexts of the photographs. Together, poems and photographs combine to create a work that is multi-faceted, immersive, and speculative, inviting reflection on how we envision our history. Uniquely the exhibition features albumen prints made from Williams’s negatives by contemporary photographer Wayne Barrar. Most of Williams’s archive at the Alexander Turnbull Library is in the form of glass plate negatives and lantern slides, and scans of these would typically be used to make digital prints for exhibition. The hand-made albumen prints produced here, using nineteenth-century processes, not only yield beautiful tones and details (ideally suited to Williams’s work) but provide a similar material and visual feel to the prints Williams and his peers would have produced. Albumen prints are rarely made today since the process is extremely complex, painstaking and time-consuming – including careful separation of egg whites for the albumen base, precise hand-coating of the paper to avoid bubbling, long exposures in UV light, and gold toning. On a few occasions albumen exhibition prints have been made overseas using ‘historic’ negatives, but it appears that Young Country may be the first time this has been done in New Zealand.